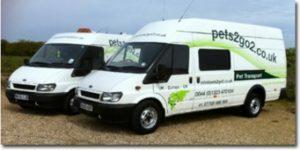 UK based pet animal transport company run by pet owners. If you dislike the thought of your pets being moved via air why not consider us. We use ex-police vehicles which contain built in compartments rather than cages/crates for your pets safety and comfort (especially for larger dogs) and transport pets by road which we feel is less stressful to your pets than travelling by aeroplane. Our vehicles are air-conditioned and we provide everything your pets shall need during their journey. Dogs are exercised every 2/3 hours on slip leads and we use the Euro tunnel for speed and so we are able to stay with your pet at all times. We hold type 2 animal transport certificates and operate to the Pet Travel Scheme guidelines. Pet Passport or Not? Not a problem we can arrange the issue of these for your pets and all relevant documents are checked prior to departure for you. We are Defra Registered and are fully insured for animal transport. UK and European Pet Transport Service – for more information visit Services Page or call us on the number below.